"History of Hair Dresses and Wigs through the Ages"
At all times the hairdressing has been the first pageantry used to be identified culturally, socially and symbolically, and still even today in our modern societies (or sometimes however preserved societies), the goal of this first asset of identification remained unchanged. A Buddhist monk, a punk, a Rasta or a sâdhu, a politician of right-hand side, left or extremist, a woman residing in the 16th district in Paris rather than in suburbs, until traces of doping in the sportsmen, everything can be detected in this astonishing living matter and sometimes mystical whom represents the hair and its use. And even today, this original purpose of identification has remained unchanged and each hairstyle is the reflection of the person who wears it. Look around you, everyone is different, each hairstyle is unique and reflects the image of its “owner”! Resulting from many methodical historical researches this unique conference is also a collection of tender anecdotes, funny and crusty that will let you interrogative when you will look again in a mirror your own hair nature. By having acquired in my career as Hairdresser Chief and Wig maker a great experience of history by working on many French and international historical movies (like "Marie-Antoinette" from Sofia Coppola) as well on many shows for opera, I have discover since a long time by looking at films of historical reconstitutions, whatever is their origin, they had so often so many anachronisms and so much aberrations due primarily to the lack of methodical and thorough research. Thus I soon realized that the historical hair dresses and wigs were never corresponding to the reality of the specific periods and that there was always the same white wigs with always the same style regardless of the years, the centuries and the kings concerned, until obtaining sometimes some volumes ten times less important than in the reality! This is really shocking when it comes from historical reconstitutions that are made for inexperienced and neophytes public which will literally accept all information that are delivered to them. It is inconceivable and unacceptable that some professionals can produce some such mock, in consideration also of the colossal budgets which represent this type of productions and especially in the respect of an ethics to the attention of spectators. Thus I decided to discover the truth about the fashions and their origins through the centuries and to restore the accuracy of styles in the reality. So I have undertaken some research in 2003 with the help of many books of history of art in order to teach my knowledge to students and stakeholders in cinema and arts of fashion to enable them to carry out in the future a work of reconstitution impresses of much more exactitude. It led me quickly provide university conferences in France and abroad as well for some more general public, with the delight of the audiences to listen to me describe some crusty stories however veracious of these Great ladies and to look at me mimic some situations sometimes really comical. I have therefore continued constantly my research on the different historical periods, because I was myself going from discovery to discovery in the reconstitution of the fashions and sometimes even in the etymology of some words of the French language… And thus to discover some truths that have never been revealed until now! Thus I discovered among other things, with the help of historical paintings, that Joan of Arc has been painted with a “bowl haircut” only from the nineteenth century, the paintings of the fifteenth century all depicting her with long hair. And when the recent movie of Luc Besson is showing Milla Jovovich with short hair, what’s a mistake! Something is going wrong! And what’s about Charlemagne called "the Emperor with the flowered beard", it will be only from the fourteenth century at the request of the “inquisitive Church ", while the ninth century paintings represent him well shaved or sometimes wearing some beautiful moustaches called “bacchantes”! And isn't Paris the international capital of the fashion since centuries and still today, but where does it come from? 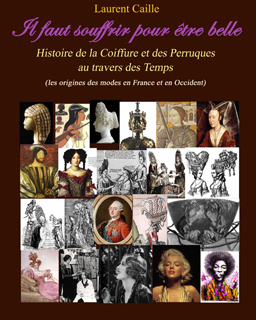 International Conference for university, professional and private public given on the topic of " "History of Hair Dresses and Wigs through the Ages", the origins of the fashions in France and Europe. It is approached as an introduction of this conference the topic of the job of Hairdresser Chief - Wig maker in the entertainment business, accompanied by various anecdotes through my professional career. This intervention is designed with a slide show of paintings and photographs displayed on TV screen or monitors, as well as on giant screen using a projector or overhead projector. This conference is provided in English or French, with translators in other languages if necessary. This conference can be organized at any time at your convenience according to my availabilities and does not require however any particular preliminary preparation. The duration of the conference is flexible according to the needs of each company and university, an average of 4 hours is however a base suggested for an optimal discovery. Summarized versions of 2 or 3 hours to the attention of general public are however possible. Some alternatives versions for public of professionals are possible too including demonstrations of historical hairstyles and in order also to get a better attention of the public. Some practice sessions for the participants can also be organized to measure at your convenience. A longer duration is also possible in a hairdressing training course of historical hairstyles of time (consult me). Thematic conferences for the diffusion of French culture. This unique intervention is dedicated to make some public of professionals aware of the importance of precise period and of the rigour in the research to be applied while working on a historical reconstitution, whatever the time, but also to inform the broader and profane audiences of the secrecies and the mysteries which the French history conceals. Appropriate conference room (from small assembly to amphitheatre possible). A projection screen and video projector or monitor(s) / TV(s). Possibly a sound system according to the size of the room. To define for the lecturer. Provide a translator if necessary and the related wages. Consistence of job and logistic: analysis of scenario and working plan, preparation of equipments and wigs, preview budget for stuff and teams needed. Being sure of all the fitting for the entire movie, and for everyday... Be aware of all the details…! Permanent attention! - The difficulty of the job: timing, weather conditions, requirements, obligation of result, success..
How did appear the fashions in the different societies and how it did change trough the ages. In Western Countries and especially in France, the main base of fashion in the world since hundreds years… Presentation with many fairy-tales and real small stories that are showing how the past civilisations did make change the fashion or create the fashions and styles trough the ages, for a long term. (need normally more than 1 hour, but it can be possible to do eventually a nice and attractive demonstration quicker) Can not be done on each conference! "It is necessary to suffer to be beautiful"